eCite - The case of reflective journals: Is the jury still out? 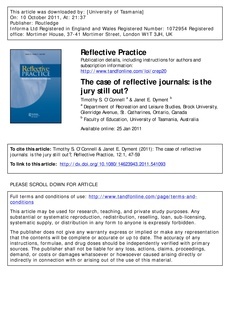 The case of reflective journals: Is the jury still out? The use of reflective journals with students is a popular form of pedagogy across a range of academic disciplines. The literature is replete with anecdotal and research�]based evidence of the benefits, issues and challenges associated with this type of teaching and learning. While the benefits of journaling are certainly noteworthy, there are also striking issues and challenges. However, it appears the �eevidence�f of these issues and challenges, while recognized in principle, is often pushed aside in light of the �efacts�f related to the positive benefits journals provide. The purpose of this paper is to reopen the case of reflective journals by examining the interdisciplinary literature on the positive and negative aspects of them.